During the condo craze in 2004-2005, Compass Cove was given a makeover and transformed into three fabulous towers of luxury condominiums. The oceanfront resort on the south end of Myrtle Beach features 530 units. Each of the towers has its own unique features and its water features. Vacationers return year after year to these beautiful condos which are conveniently close to these old air force base and all of the excitement of Market Common. The low-rise Schooner is a 4 story complex that features low priced efficiencies and smaller condos with incredible amenities. There is a breakfast restaurant for those who are anxious to start their day. Indoor/outdoor pools, kiddie pools, lazy rivers, Jacuzzis, and a tiki bar provide a variety of ways to unwind without leaving the resort. There is also a conference room for large gatherings and a game room for kids of all ages. During the off-season, golfers can take advantage of an inexpensive vacation filled with golf at many of the championship courses at the south end of Myrtle Beach, in Surfside, and Murrells Inlet. There’s a lot to love about this small condos. These oceanfront condos are ideal as a rental income and for young families. The Pinnacle offers suites, efficiencies, and penthouse condos that feature stunning views of the ocean and beach. Besides the usual indoor and outdoor pools, Jacuzzis, and lazy rivers, this family-friendly tower has an attraction designed just for the kids. There is a gift shop to find the perfect little something for the house sitter back home and a lounge where you can unwind with a drink, food, and friends. Spacious condos with 1-3 bedrooms can be found at the Mariner. The 15-story oceanfront tower has large units with spectacular views. Two and three bedroom floor plans feature 2 bathrooms, full kitchens, and extra-large living rooms. Along with its own water amenities, the Mariner has a fitness center and a parking garage. Whether you are looking for a rental investment or a family vacation home, Compass Cove is an incredible choice. If you would like to know more and see some of our current listings, please visit our website. 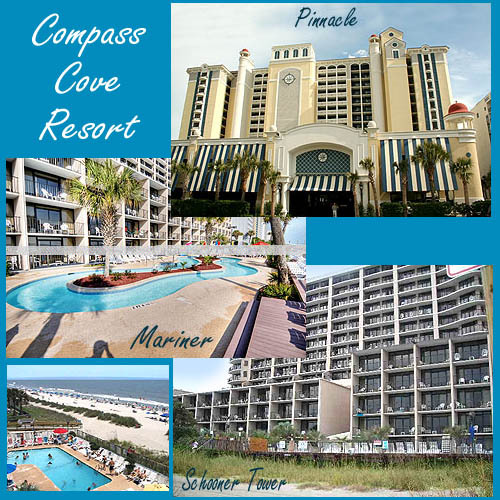 Call our real estate professionals today to schedule a private tour of the condos for sale at Compass Cove Resort. We’re here to help.